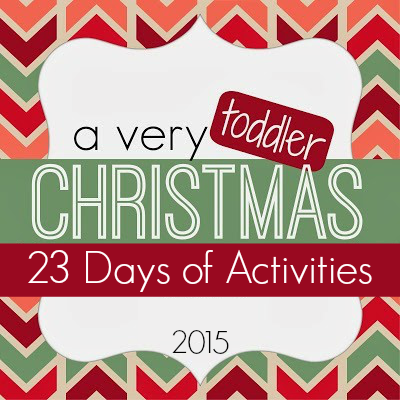 We are on Day 12 of our A Very Toddler Christmas series! So far our favorite activities have been Christmas science and the Christmas toss game. How about you? Today we are doing mess-free Christmas painting! 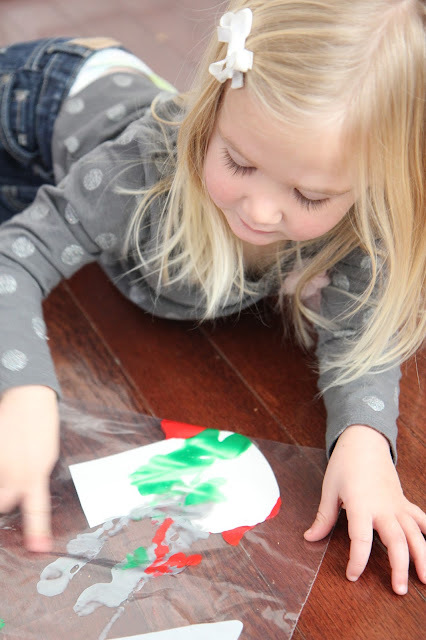 This activity is totally all about the process... not the end result... and is such fun sensory experience. 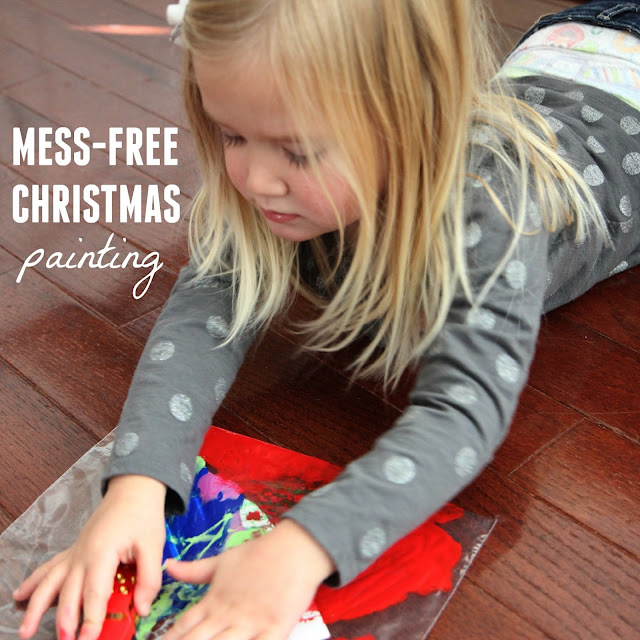 We've shared how to do mess-free painting before. It is really simple. 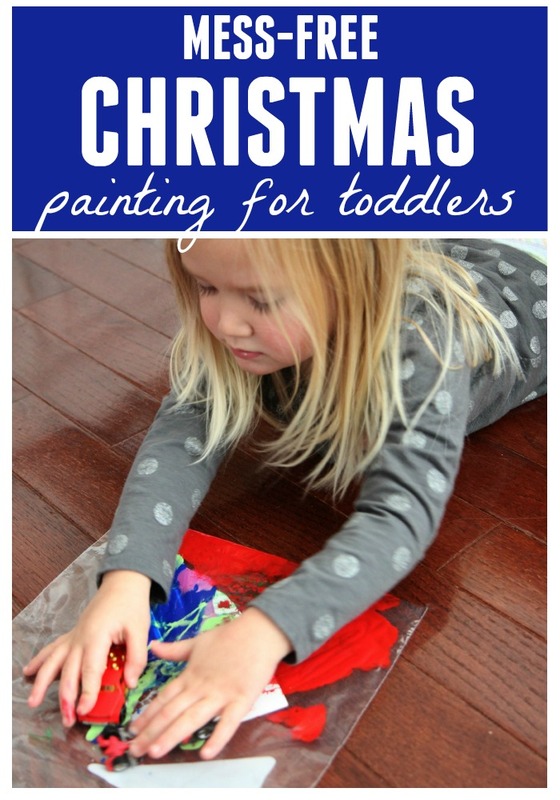 Start by cutting a Christmas shape out of cardstock and then stick it in a ziploc bag. We cut out Christmas trees and stockings. 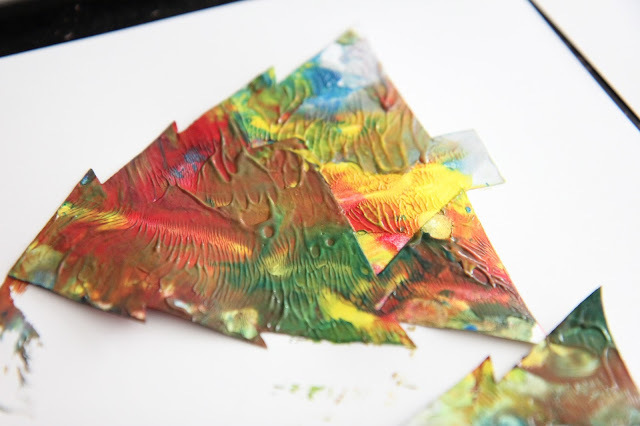 Next, squirt some paint into the ziploc bag on top of the cardstock paper shapes and then remove as much air as possible from the baggie so it can be flat and then seal it shut. If you leave too many air bubbles your bag won't be flat and you might end up with explosive messy bag painting instead of mess-free painting! Next move your hands over the outside baggie to help spread the paint around. We like to use matchbox cars as well. 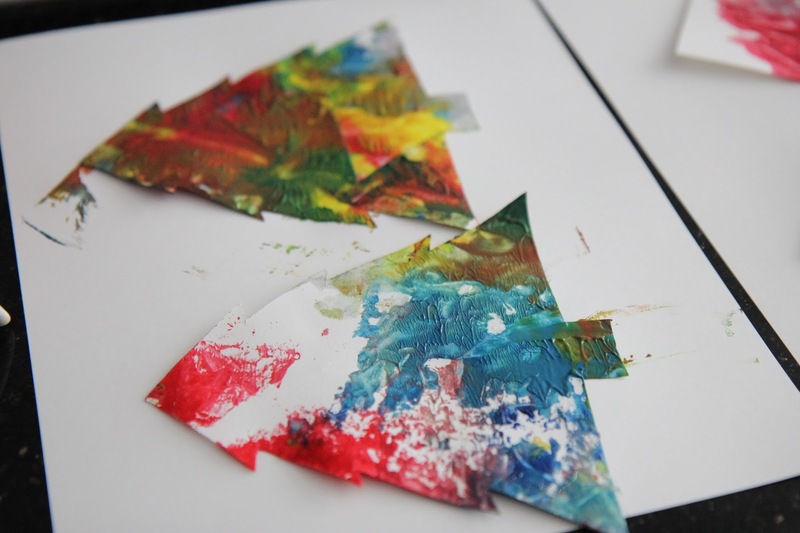 After a minute or two of spreading the paint around, remove your paper shape from the paint and lay it flat to dry. If you leave the paper in the paint too long it gets saturated and will rip easily... so avoid that! We loved the colors on the Christmas trees. So gorgeous! 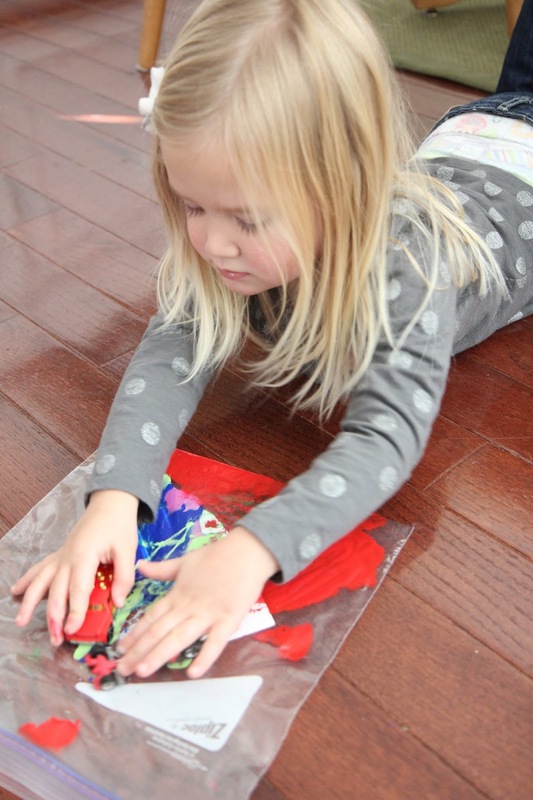 This activity is virtually mess free. When you pull the shape out of the paint you may get a little bit of paint on your fingers but other than that, you'll be fine! 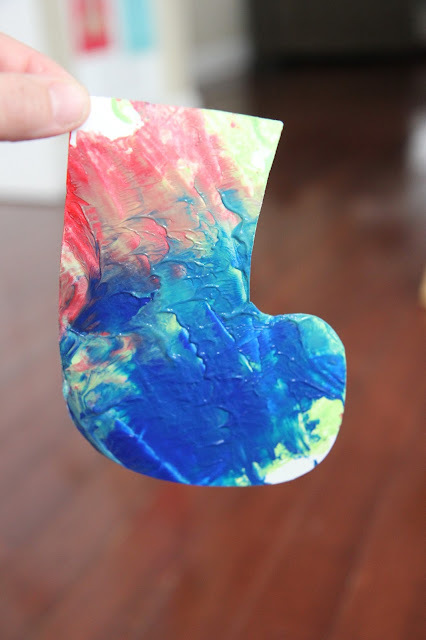 These Christmas shapes can be used to make Christmas cards or a banner or just get hung up as wall art. Have you ever done mess-free painting before? Do you have any other favorite mess-free activities? Make sure to stop by tomorrow and see what the Kindness Elves have been up to at our house and what other Christmas fun we've been having.